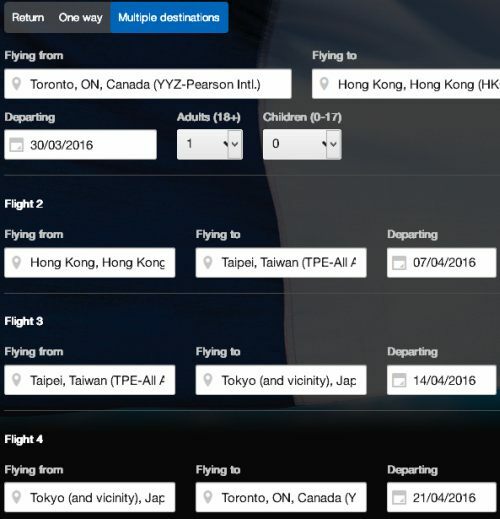 There's a very interesting multi-country deal to Asia that's available at the moment, which involves flying from Toronto to Hong Kong, to Taiwan, to Japan, and back home, all for just $911 CAD roundtrip including taxes. 1) You can spend time in each country. In the examples below, you'll see that it's possible to spend a week (or more) at each stop. 2) The flights are all non-stop throughout the entire journey. 3) For the last stop of the journey, Tokyo, Japan, you can time it to be there in April, a highly desired time to visit (cherry blossom season). The pricetag is around what one would typically consider a good roundtrip price from Toronto to just one of these 3 countries on their own. It can be worth experimenting with other dates if you want to try staying for shorter or longer periods of time. Using Wed and Thu dates is probably your best bet to start with. Note that you fly into Tokyo's Narita (NRT) airport, but fly out of Tokyo's Haneda (HND) airport. Haneda is the one that's closer to downtown Tokyo. Expedia and Travelocity are ranked #1 and #5 respectively in the Third Party Booking Site Power Rankings. It's also possible to use Seoul, South Korea (ICN) instead of Tokyo, Japan. The price will work out to $917 CAD including taxes. There is 1 stop in Vancouver on the way home from Seoul to Toronto. Thanks to Eric for the tip! Where to stay in Hong Kong or Taiwan, or Tokyo, or Seoul? The following AirBNB links will lead you to some great deals on places to stay in Hong Kong, or Taiwan, or Tokyo or Seoul for under $69-$99 CAD/night for 2 people. toronto, yyz, flight deals, air canada, asia, tokyo, japan, nrt, east asia, hnd, taipei, taiwan, tpe, hong kong, hkg, cathay pacific, seoul, south korea, icn and hong kong airlines. 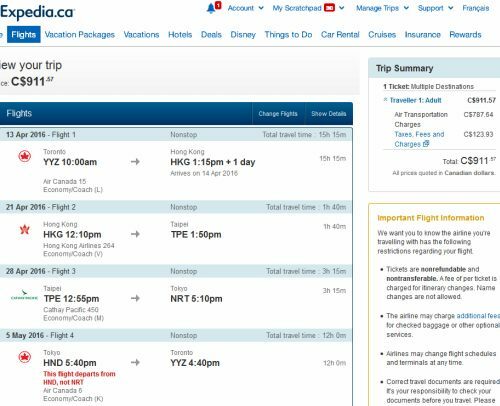 22 Responses to "Multi-Country Asia Deal - Toronto to Hong Kong, to Taiwan, to Japan, and back home - all for $911 CAD including taxes"
I want this deal, but expedia is dead. :( anyone else had luck? I got it booked too! amazing deal! I was able to book it as well, between late May to early June, great deal! I tried the date combinations but the price is $1663 on googleflights. 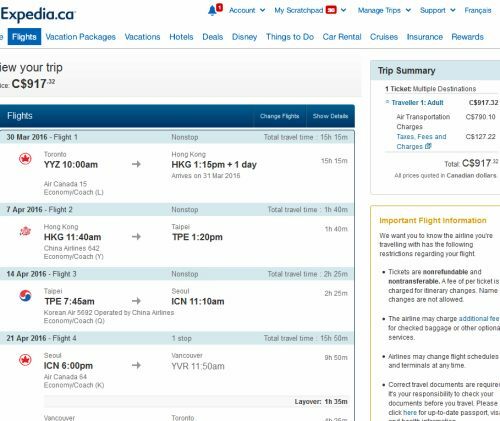 Found the deal through google flights but expedia.ca still charging the same if not more. Works with switching Japan to Korea too! Thanks Eric! I'll update the post. We booked as well! 3/2-3/16 - Great deal! Booked for two! Any travel tips for Taiwan and exploring the country? I really had no idea what to expect with Taiwan, as I just decided to go when a great deal came up to Taipei. I really enjoyed it. Taroko Gorge in the East. Some very nice beaches in the south. There's also some nice hikes just outside of Taipei (look up Pingxi or Pingsi). Are any of the above dates still available?! Why not try and let us know? Just booked late May and early June as well. Still alive, as of Nov 30! Ummm...booked yesterday for $921. Now up to $1140. Tried adjusting the dates, give or take a couple of days. Not much difference. Still a good price though.